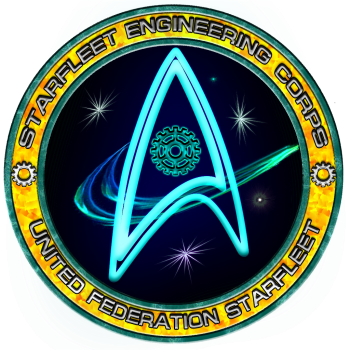 The United Federation Starfleet Engineering Branch is responsible for maintenance on starfleet Ships, Stations, Facilities and Outposts. The United Federation Starfleet Corps. of Engineers practice the truest form of "behind the scenes" work in Starfleet. You don't always see them, but they are there, making sure that everything goes as smoothly as possible. These officers and enlisted personnel are the miracle workers of the fleet, giving their lives to the ship and crew; holding the ship together long enough to vanquish the enemy, or escape with enough to get to safety. They are the Construction Force; building the very ships and stations which all of UF Starfleet uses. Research and Development are the dreamers and schemers of Starfleet. Those in R&D are charged with development or refinement of technology for Starfleet and the Federation. R&D is highly sub divided into specific fields some have only one or two people in it. Several of the larger ones are Theoretical Engineering which develops completely new technology for use. Tactical R&D which reverse engineered the Transphasic Torpedo brought back by Voyager. Propulsion R&D which refined Warp Fields when they were shown to be harmful to subspace, and along with other departments developed the Quantum Slipstream Drive. Think you have what it takes to brave the plasma fires of battle damage? Do you have the concentration to repair an EPS and not succumb to megawatts of energy while under fire? Do you want to give yourself over to the need to replace the ships lost in space? Can you handle the constant dangers that construction often presents to those who rise to that challenge? Perhaps you're a Combat Engineer, who is going into face the enemy, plant explosives, and get out with only your life intact? Perhaps you will face the enemy with the torches and tools that are the mark of our trade. If you have any questions about the Engineering branch, contact the Head of UF Starfleet Corps of Engineers. This page was last edited on 1 March 2018, at 02:58.